Budapest is not only the capital of Hungary, but also the country's largest city and a center of transportation, industry, and culture. Attracting approximately 4.3 million tourists a year, it is arguably one of the most beautiful metropolitan areas in all of Europe, thanks in part to its breathtaking architecture, as well as its position on the banks of the Danube River. The city is also home to the world's largest thermal water cave system, 80 geothermal springs, and several Turkish baths that are still in use 500 years after Turkish occupation of the region. The cities of Buda and Pest were separated by the Danube River until 1849 when the Chain Bridge was built linking the two. Both were then merged along with Obuda, officially creating the metropolis of Budapest. The city was partially destroyed by American and British air raids in 1944 during World War II, and suffered further loss during the Battle of Budapest in 1945. In 1949, Hungary was declared a communist People's Republic, and in 1956, the Hungarian Revolution broke out. It wasn't until the 1960s through the 1980s that most of the damage to the city was repaired. 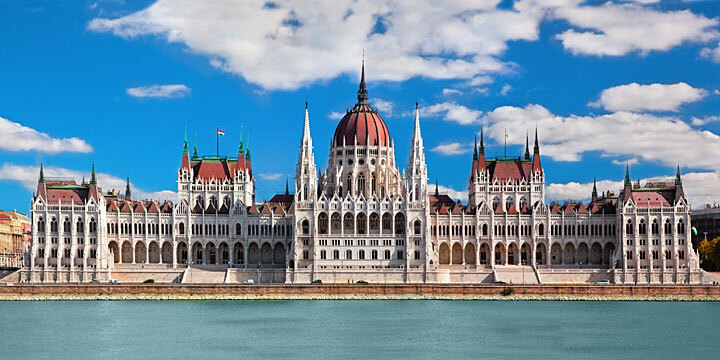 Points of interest include the Parliament building containing the Hungary Crown Jewels, Saint Stephen's Basilica, the former Royal Palace, the largest synagogue in Europe, and the Castle District. The entire city contains 223 museums and galleries, forty theaters, seven concert halls, and an opera house. Visitors will also find many picturesque squares and avenues throughout, as well as seven bridges crisscrossing the city. Budapest is easily reached by car or by air to the Ferenc Liszt International Airport, as well as other international airports within three hours of the city by train or bus. Public transportation around Budapest is provided by buses, trolleys, trams, railway lines, the metro, and boat service. Visitors can obtain 24 and 72 hour cards enabling free public transportation and discounts to restaurants, museums, and other points of interests, making the beauty and culture of Budapest something that should not be discounted on any serious trek through Europe!